Upon issues with a few of the Indian manufacturer’s supermini catching fire in quite a lot of situations there’s now a free safety upgrade for the car. What’s weird about this is the fact that Tata insists on this not being a recall for the Nano. I just don’t know how else to put this but it is actually a recall, isn’t it. I’m not very certain on why Tata insist on calling this a free safety upgrade. Apparently, the Indians refuse to call it a recall because the analysis of the fire problems the Tata Nano had reached a result. It seems that even though the Tata Nano has been littering the media with fire incidents they weren’t actually manufacture related. According to the company, the problems that lead to fire were related to after market modifications. Either added trinkets to the exhaust system caught fire. The same thing with the electrics. 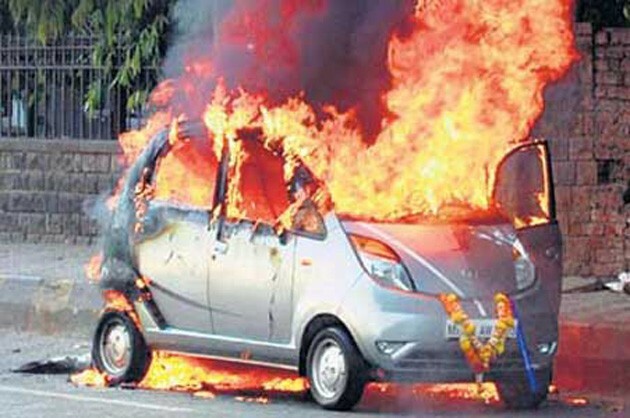 After market stereos and such also lead to electrical heat ups that lead to the same fire problems for the Tata Nano. So if you look at it from such a point of view you can see why Tata don’t call this a recall. Even so, if you’re an Indian manufacturer and don’t prepare your cars to get the mods anything in India gets and later on correct it, I’d say you’re doing a recall. The so called safety upgrade means Tata dealers will upgrade the electric insulation and the exhaust protection as well.